If you haven’t yet heard of Folklore, a restaurant at Destination Singapore Beach Road helmed by chef (and MasterChef Singapore judge) Damian D’Silva, you are seriously depriving yourself. 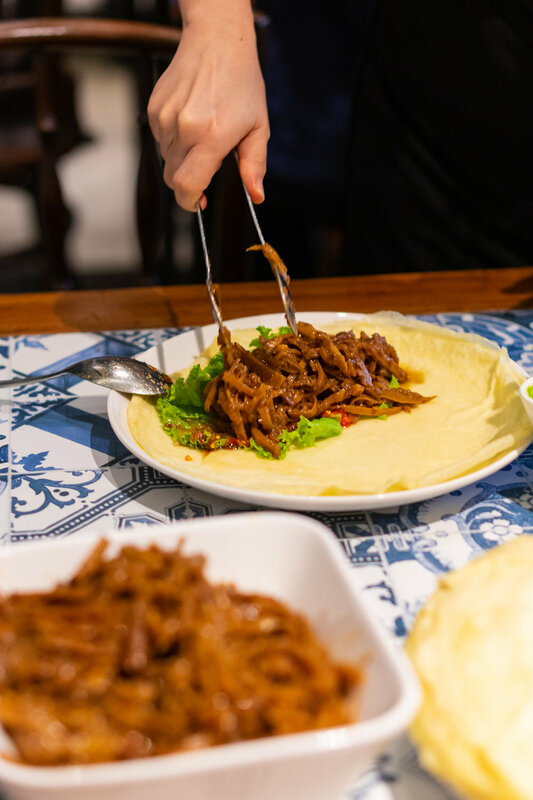 A relentless champion of heritage cuisine, you’ll find classic and soulful Peranakan dishes, as well as some forgotten Eurasian dishes not found around Singapore anymore. 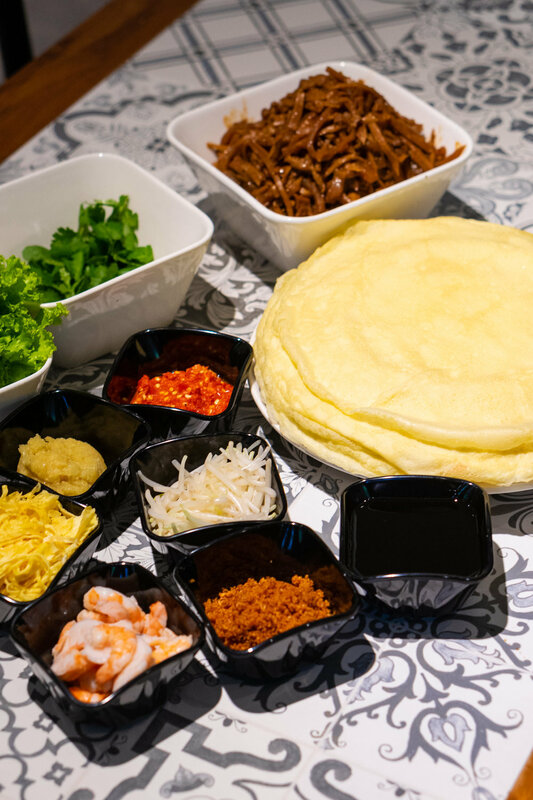 For the festivities of Chinese New Year (Folklore’s CNY menu exclusively available from 4-19 February 2019), chef highlights his maternal Peranakan side, starting with a convivial, communal affair of DIY Popiah Set ($60, good for 4 pax; also available for takeaway, $321 for min. 20 pax). Chef whips up a more egg crepe-like Popiah skin, to better hold together chunks of his generously flavoursome Intee and condiments, such as steamed crab meat, poached prawns, blended fresh chillies, boiled beansprouts, shredded omelette, minced garlic, sweet flour sauce, fried minced garlic, pang chye. 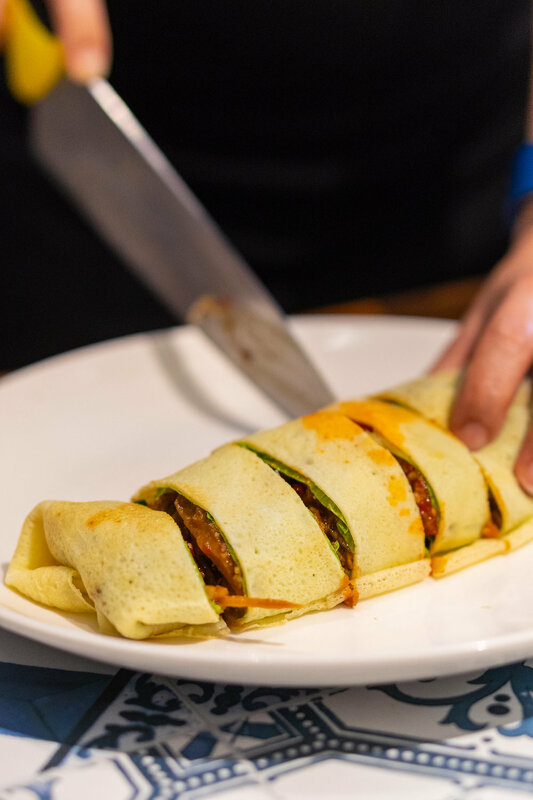 A set for 4 for comes with 10 large housemade popiah skins—chef whips up a fragrant, eggy crepe-like skin—that diners can use to pack together chunks of his generously flavoursome and hearty Intee, a recipe passed down from his grandmother. 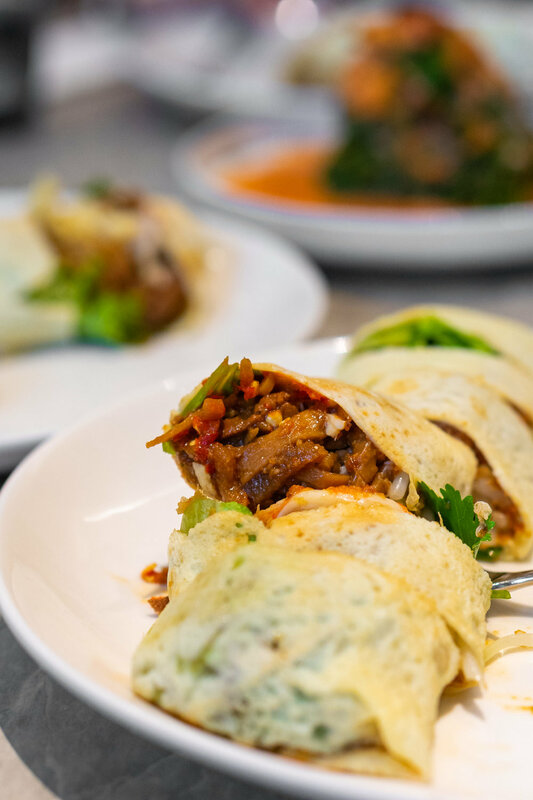 You are then free to stack on condiments, such as steamed crab meat, poached prawns, blended fresh chillies, boiled beansprouts, shredded omelette, minced garlic, sweet flour sauce, fried minced garlic, and pang chye. Spice fiends (like myself) will definitely applaud the return of chef’s almost ‘too spicy’ Peranakan Prawn Salad ($20; takeaway, $22). Poached prawns rest on cucumber and fresh local lettuce leaves, topped with a uniquely tangy, robust plum chilli sauce. The team shares that the overall spice level has been toned down, but I think perhaps only half so. The initial starting notes were slightly sweeter and a notch more refreshing than I recalled, but it is only after you’ve fallen for the guise and wolfed down a few big mouthfuls does the spice come in—and in waves. Might be already be too late, but if you can’t handle your spice well, it’s best to surrender to the warm embrace of milk. Both the chilled salad of Sayur Beremi ($16; takeaway, $18) and Sayur Kailo with Pork Ribs ($32; takeaway, $35) are very new to me. The former features a practically forgotten, leafy Indonesian vegetable with a pleasantly bittersweet taste, injecting another dimension to its accompanying rich coconut and chilli sauce. 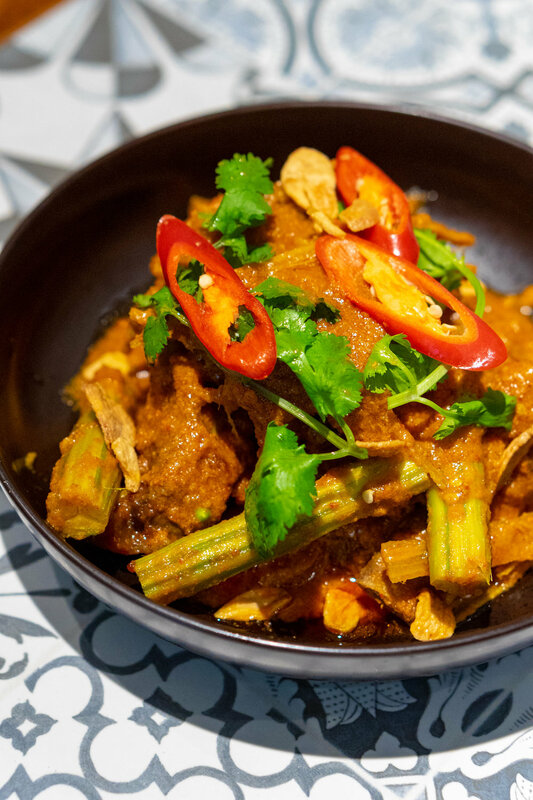 Executed with pork ribs in a full-flavoured curry, it can be a challenge to properly extract the Sayur Kailo (Moringa pods), but this vegetarian soulmate to Alaskan king crab legs will reward you with its sweet, moist flesh. 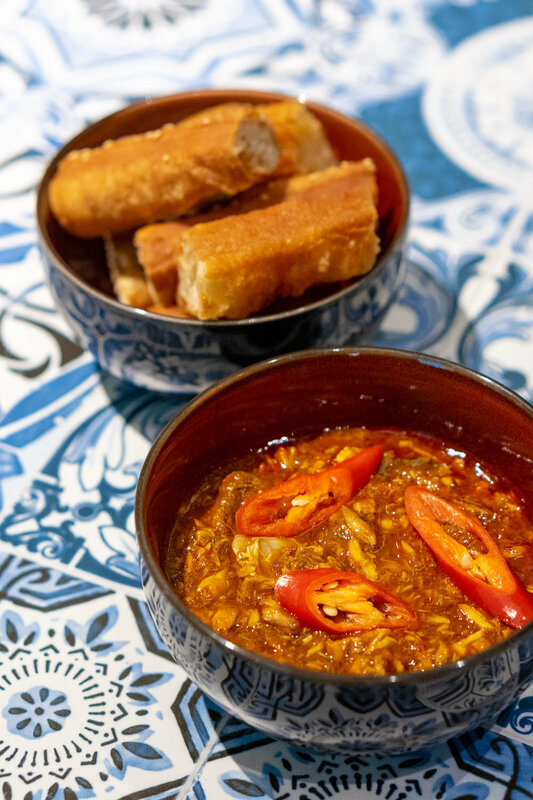 Traditionally a Chinese New Year Day 2 dish made using leftover fish, chef's Garang Assam with You Tiao ($34; takeaway, $37) is anything but an afterthought. 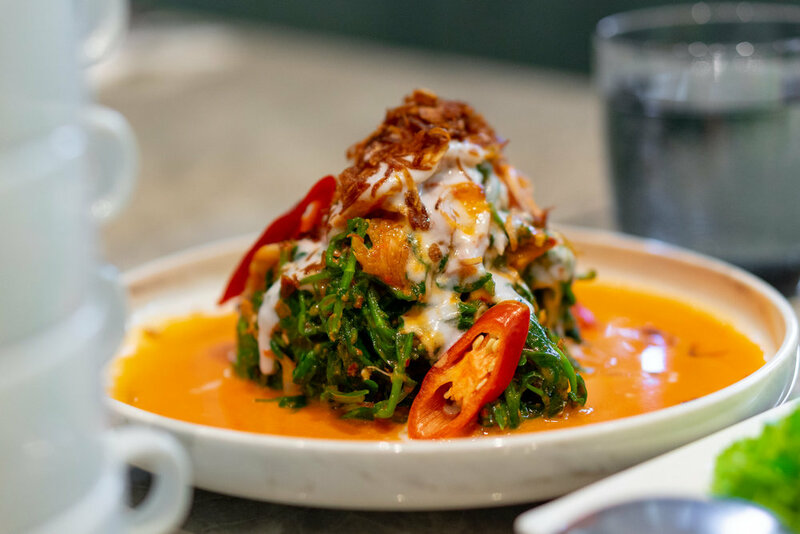 With a brilliant rempah titek base and Red Emperor Snapper to lend texture and body, the tangy and spicy, thick gravy is downright addictive and will have you wiping the bowl clean with the accompanying crisp dough fritters. Chinese New Year dining at Folklore is available from 4 to 19 February 2019 for both lunch and dinner. Festive meal takeaways are available with an advance booking of 5 working days from 30 January to 19 February.